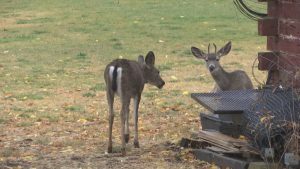 OREGON — Deer and elk struck and killed on Oregon roads can be salvaged for consumption in Oregon starting next year. Deer and elk must be accidentally hit by a vehicle and not on purpose. You also need to complete an online permit within 24-hours, providing information like where and when the animal was salvaged. The head and antlers of the animal must be surrendered to an ODFW office within 5 business days. And you must remove the carcass from the road. Here’s the full list of restrictions.